"Doctorwine" has rated the wine "Weingut Gottardi Mazzon Blauburgunder Sudtirol, Trentino-Alto Adige, Italy" from the vintage 2011 on 13.05.2014 with 90 of 100 points.
" An antique ruby color that is delicately diluted yet still very luminous. The aroma is immediate, elegant, floral and fruity without being excessive. The bouquet has all the nuances of underbrush, from humus to damp earth to wild strawberry. The floral component is dominated by rose intermingled with scents that recall pomegranate and a pleasing note of iron and mineral. This all introduces a fresh and piquant mouthfeel with discreet tannins that make this wine enjoyable even at such a young age. " "Wine & Spirits Magazine" has rated the wine "Weingut Gottardi Mazzon Blauburgunder Sudtirol, Trentino-Alto Adige, Italy" from the vintage 2012 on 01.10.2016 with 91 of 100 points. "Wine & Spirits Magazine" has rated the wine "Weingut Gottardi Mazzon Blauburgunder Sudtirol, Trentino-Alto Adige, Italy" from the vintage 2009 on 01.08.2013 with 87 of 100 points. "Vinous Antonio Galloni" has rated the wine "Weingut Gottardi Mazzon Blauburgunder Sudtirol, Trentino-Alto Adige, Italy" from the vintage 2009 on 01.02.2011 with 93 of 100 points. "Vinous Antonio Galloni" has rated the wine "Weingut Gottardi Mazzon Blauburgunder Sudtirol, Trentino-Alto Adige, Italy" from the vintage 2008 on 01.02.2011 with 89 of 100 points. "Vinous Antonio Galloni" has rated the wine "Weingut Gottardi Mazzon Blauburgunder Sudtirol, Trentino-Alto Adige, Italy" from the vintage 2007 on 01.10.2009 with 87 of 100 points. "Wine Enthusiast" has rated the wine "Weingut Gottardi Mazzon Blauburgunder Sudtirol, Trentino-Alto Adige, Italy" from the vintage 2004 on 09.01.2007 with 87 of 100 points. "Vinum Wine Magazine" has rated the wine "Weingut Gottardi Mazzon Blauburgunder Sudtirol, Trentino-Alto Adige, Italy" from the vintage 2002 on 01.02.2005 with 16 of 20 points. "Vinum Wine Magazine" has rated the wine "Weingut Gottardi Mazzon Blauburgunder Sudtirol, Trentino-Alto Adige, Italy" from the vintage 1999 on 01.01.2002 with 16 of 20 points. "CellarTracker" has rated the wine "Weingut Gottardi Mazzon Blauburgunder Sudtirol, Trentino-Alto Adige, Italy" from the vintage 2012 with 90 of 100 points. "CellarTracker" has rated the wine "Weingut Gottardi Mazzon Blauburgunder Sudtirol, Trentino-Alto Adige, Italy" from the vintage 2014 with 90 of 100 points. 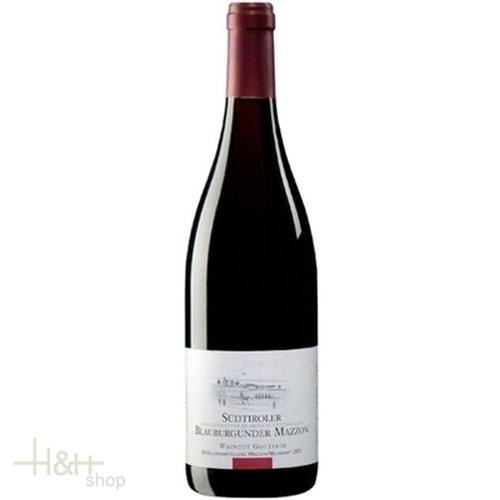 "CellarTracker" has rated the wine "Weingut Gottardi Mazzon Blauburgunder Sudtirol, Trentino-Alto Adige, Italy" from the vintage 2009 with 89 of 100 points. "CellarTracker" has rated the wine "Weingut Gottardi Mazzon Blauburgunder Sudtirol, Trentino-Alto Adige, Italy" from the vintage 2004 with 88 of 100 points. "CellarTracker" has rated the wine "Weingut Gottardi Mazzon Blauburgunder Sudtirol, Trentino-Alto Adige, Italy" from the vintage 2007 with 88 of 100 points. "Stephen Tanzer" has rated the wine "Weingut Gottardi Mazzon Blauburgunder Sudtirol, Trentino-Alto Adige, Italy" from the vintage 2009 with 88 of 100 points. An extremely elegant wine with impressive structure and a full, complex bouquet, well-balanced on the palate with excellent mouth feel and fruit underpinned by firm, mouth-watering acidity. GewÃ¼rztraminer Selida - 2018 - cantina Termeno 14,45 EUR / 19,27 €/lt. RosÃ© IGT - 2018 - Winery Caldaro 10,95 EUR / 14,60 €/lt. Pinot Noir Graf von Meran - 2015 - Cantina Merano 20,90 EUR / 27,87 €/lt. GewÃ¼rztraminer Roen vend. tardiva -2017- cantina Termeno 29,95 EUR / 79,87 €/lt.